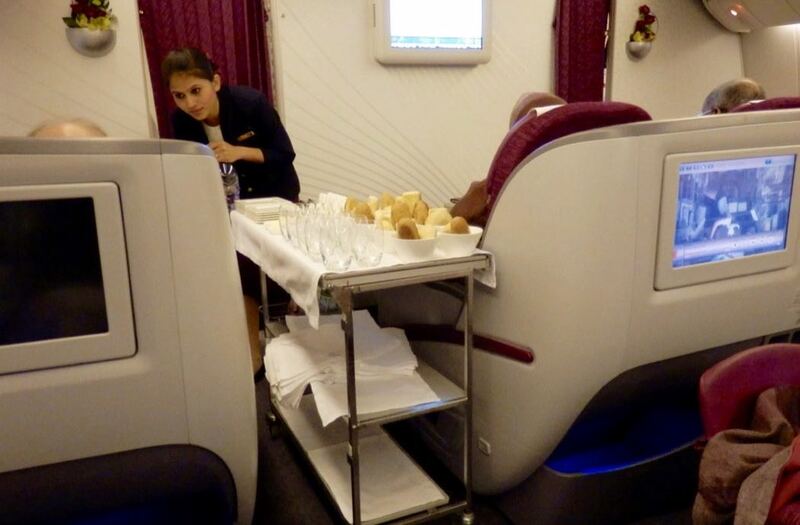 In this review I flew Business Class with Qatar Airways from Brussels (BRU) to Bangkok (BKK) via Doha (DOH) on a Boeing 777-300ER. The first leg of the trip from Brussels to Doha was flown in Business Class on a Boeing 787 Dreamliner and the experience was excellent. The second leg of the overnight trip (DOH-BKK) was flown in a Boeing 777-300ER and is described below and although the experience was excellent, it was not as good as on the Dreamliner. The airport lounge you get access to flying in business on Qatar is the Al Mourjan lounge at Doha airport. 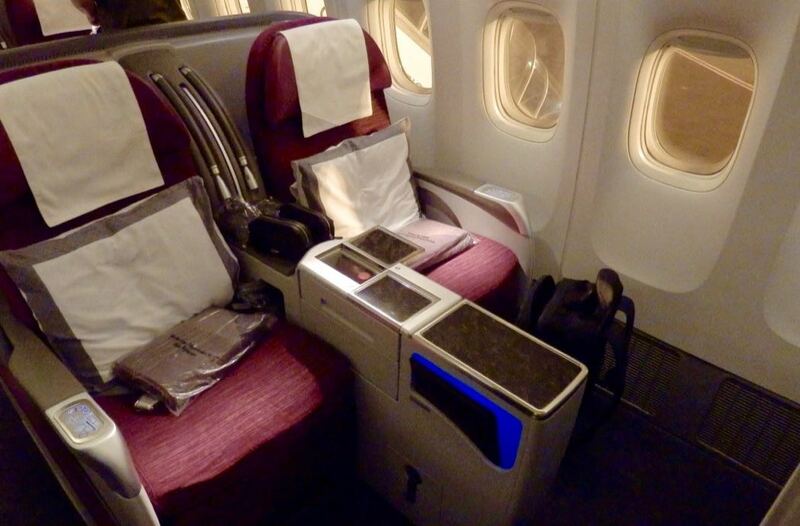 Business Class in Qatar’s B777-300ER is fitted in a 2-2-2 configuration, with all seats facing forward (see pictures below). Window seats in this configuration have no direct aisle access none of the seats in this design have much privacy. 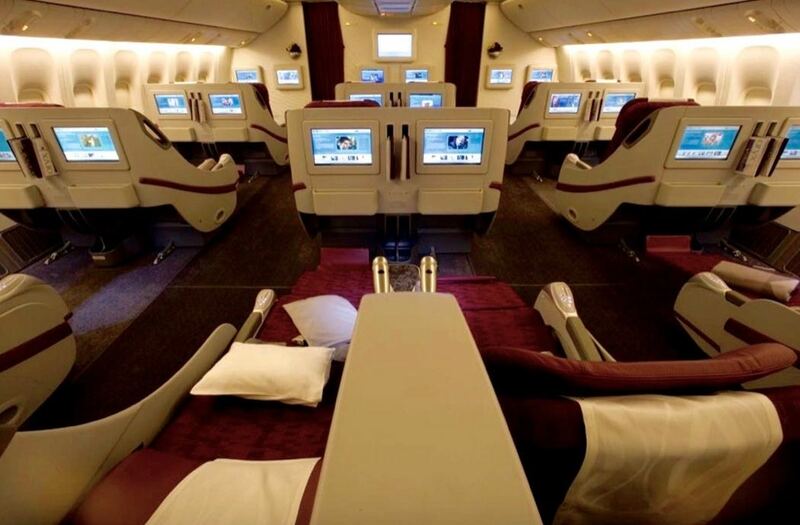 This gives an advantage to Qatar’s Dreamliner, since each of its seats has direct aisle access (1-2-1 configuration) and a huge amount of privacy. The seat itself is excellent with a pitch of 78 and a width of 22 inches. The seat features a massage function and has many fine controls for seat position. It is very comfortable in the full lie-flat position, assuring that even the most picky of passengers can comfortably sleep on their side or turn around while sleeping. Unfortunately, and contrary to Qatar’s Dreamliner overnight service, a feather duvet to enhance sleeping comfort is not provided. 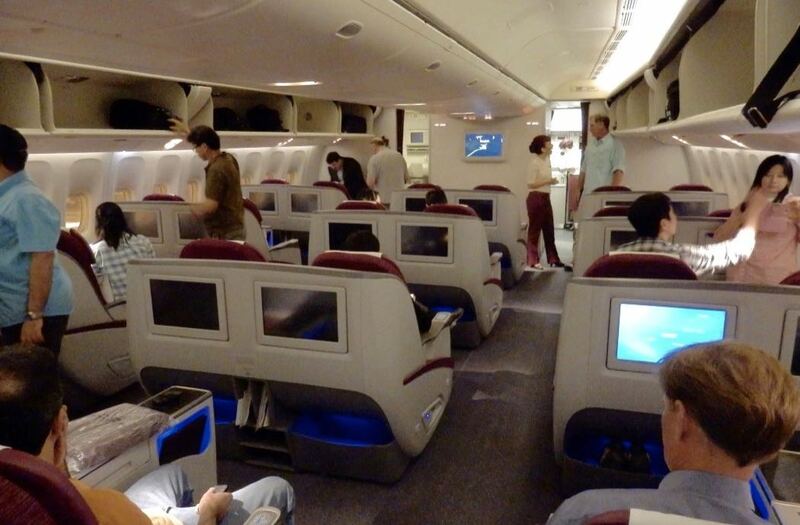 Storage space in Qatar’s 777-300ER Business Class is excellent with very large overhead lockers and a further good-sized bin under the seat in front and a storage space for shoes, a spacious side pocket for magazines and the menu, and a large table which comes out of the arm. TV screens are incorporated in the seat in front of you and measure 17 inches. The Internet is not available on the Boeing 777-300ER (contrary to the Dreamliner). 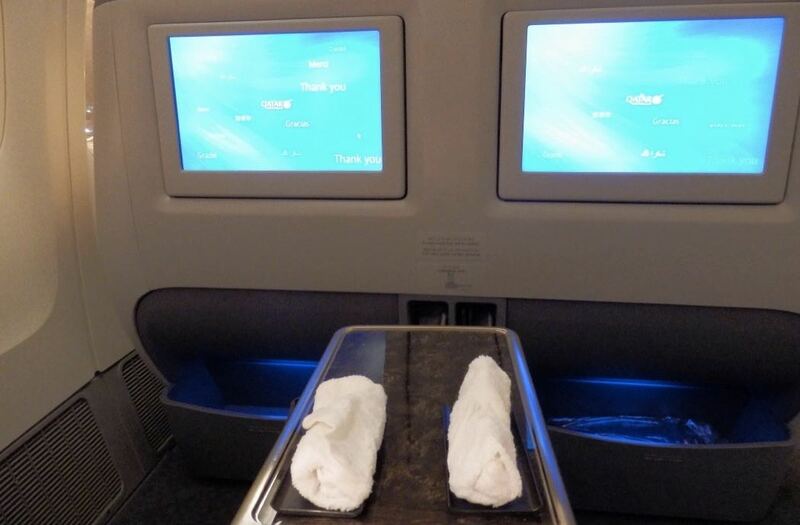 Each seat comes with a decent blanket, a good-sized pillow, and an amenity kit (I feel this is one of the best amenity kit of any airline and it is identical to the one offered on the Dreamliner). 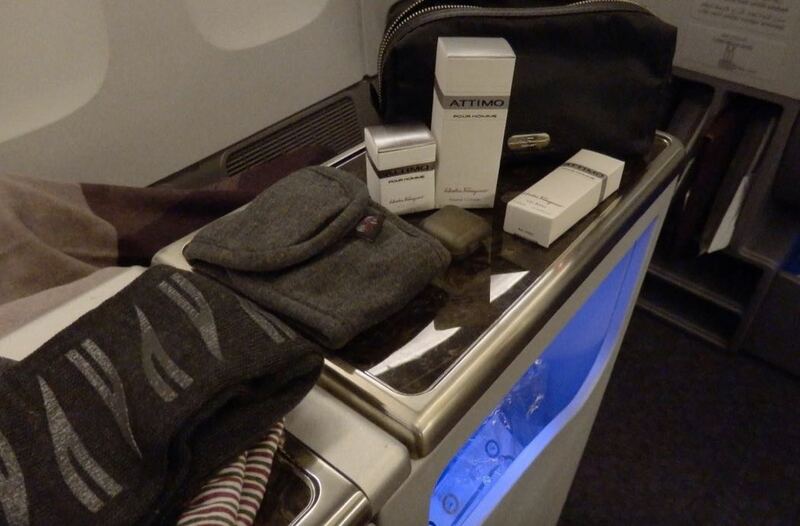 The kit is made up from a bag with socks, eyeshade, earplugs and a comb, and a Salvatore Ferragamo kit that contains Attimo 5ml Eau de Toilette, 10ml lip balm and a 20ml hand cream or refreshing water. Pajamas are also offered on an overnight flight. Toothbrush and shaving razors are supplied in the bathrooms. 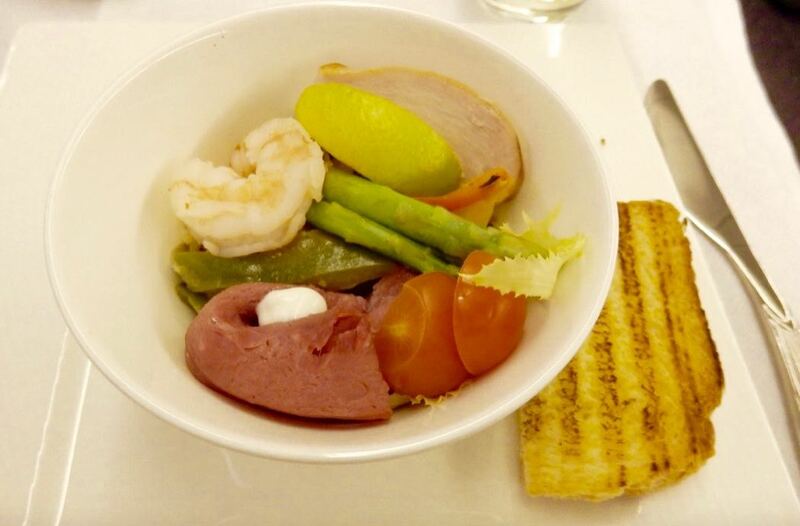 Food on Qatar Airways tends to be very good. 30 minutes after take-off, I choose a sprite with ice and lime as a drink, and was offered an appetizer of smoked salmon kelp roll (with ponzu sauce). 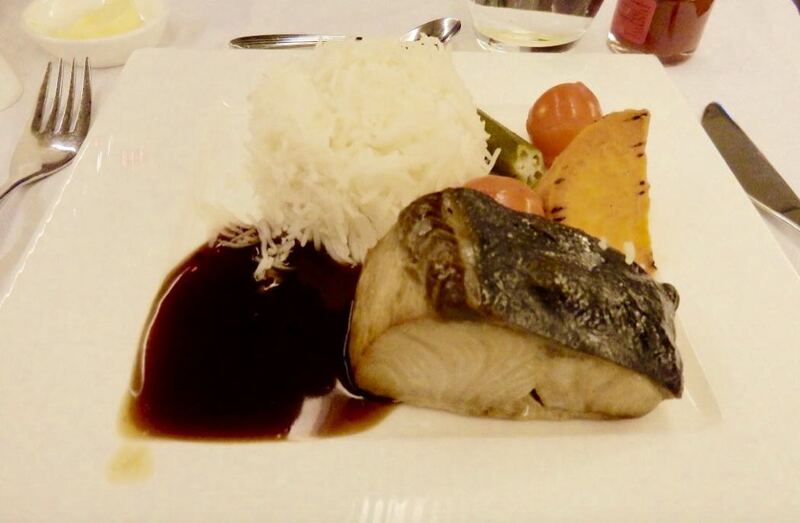 Dinner was served one hour after take-off. As a starter, I choose the individual buffet of smoked salmon, chicken and prawn, with crisp leaves, cherry tomato, asparagus, horse radish cream cheese, fennel and bell pepper salad, served with toasted brioche. It tasted excellent. As an entrée, I choose the Nobu dish: yellowtail tuna with teriyaki and truffle sauce, sweet potato, roasted cherry tomato and okra. 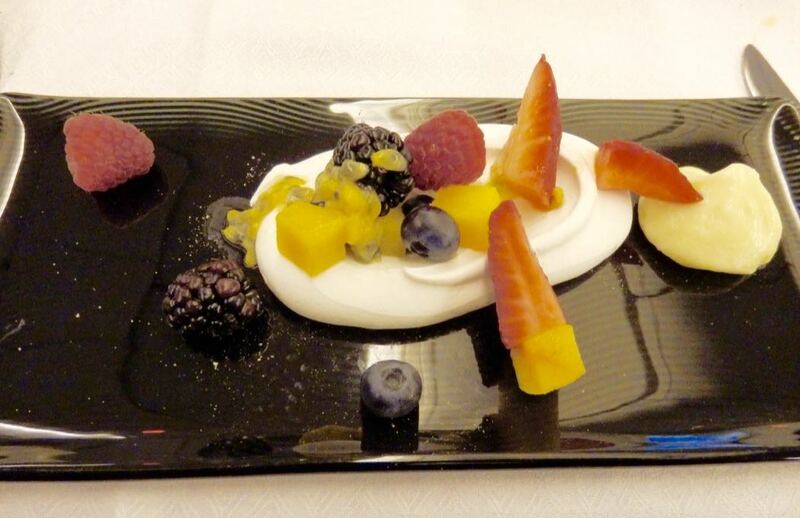 For dessert, I had the baked meringue with fresh berries and lime curd. Delicious! Ninety minutes prior to landing, after a 3 hour rest, I was awakened by the flight attendants for breakfast. 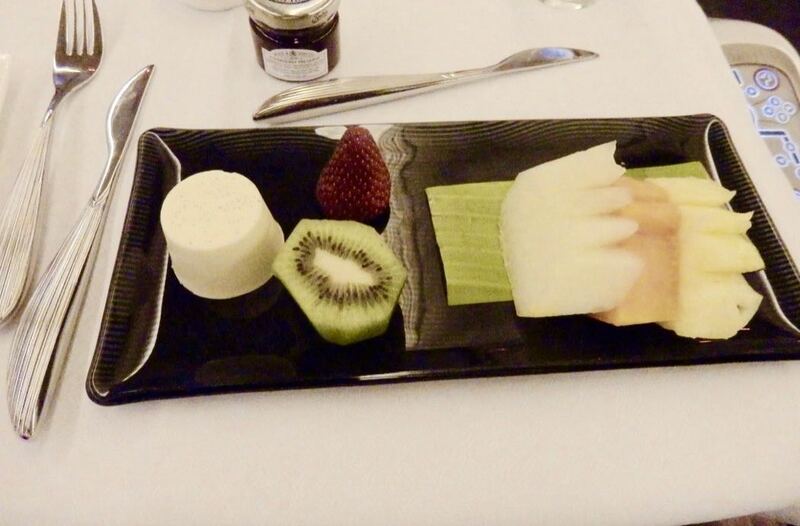 I had a raspberry and mango smoothie, followed by a selection of seasonal fresh fruits with vanilla pannacotta. As usual with Qatar Airways, the customer service and crew was above and beyond as they try to know your name, remember how many times you have travelled with them before and they constantly pass by to check if you need anything to eat to drink. 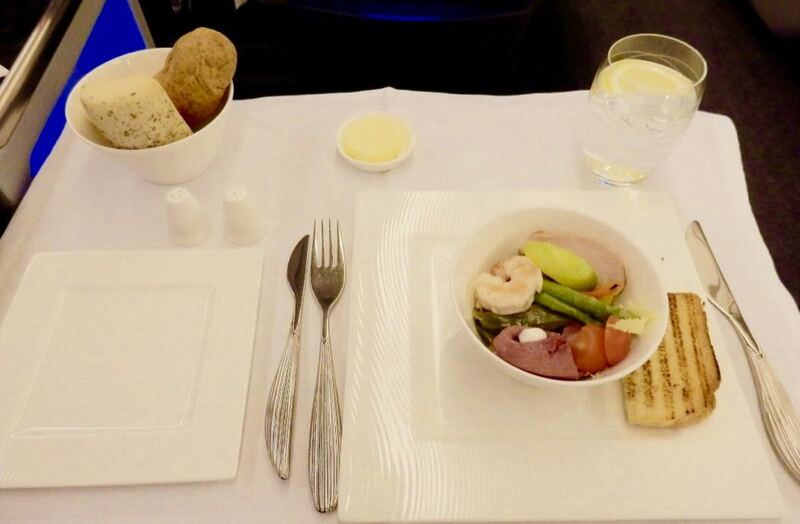 The 3 major Middle Eastern carriers (Etihad airways, Emirates, Qatar Airways) are known for their excellent Business Class. However, there are some differences that distinguish one from another. The noteworthy differences include the complimentary chauffeur-driven airport transfers offered by Etihad and Emirates offer but not by Qatar Airways. 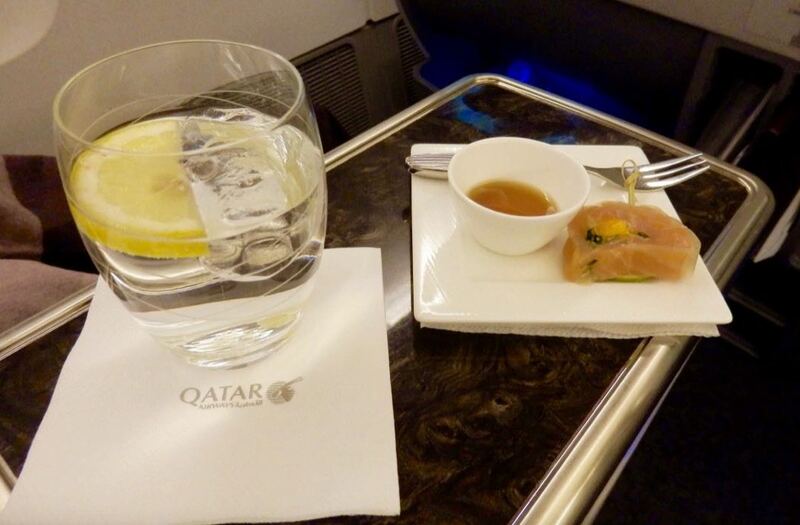 Qatar Airways offers pyjamas on overnight medium- and long-haul flights, while Etihad and Emirates only offer them in First Class. Qatar Airways and Emirates offer duvets on medium-haul flights (to increase sleeping comfort), while Etihad only offers them on longhaul flights.